Capelle aan den IJssel – In clashes between Moluccan youths and the mobile unit in Capelle aan den IJssel are definitely two wounded. An agent walked severe head injuries. A Moluccan-Dutch youngster was hit in the leg by a police bullet. The reason for the confrontation was the expulsion of eight families in the district Oostgaarde. The tension built up for years in the district Oostgaarde, This Wednesday was at once out. The two groups came face to face with each other. On the one hand the mobile unit and on the other hand, the group Moluccans. While the agents shield, were ready service pistol and baton, Moluccans had to make do with whatever they could use as a weapon; sticks, spears, an axe. In the absence of other resources was one of the men even picked a shovel as a weapon. 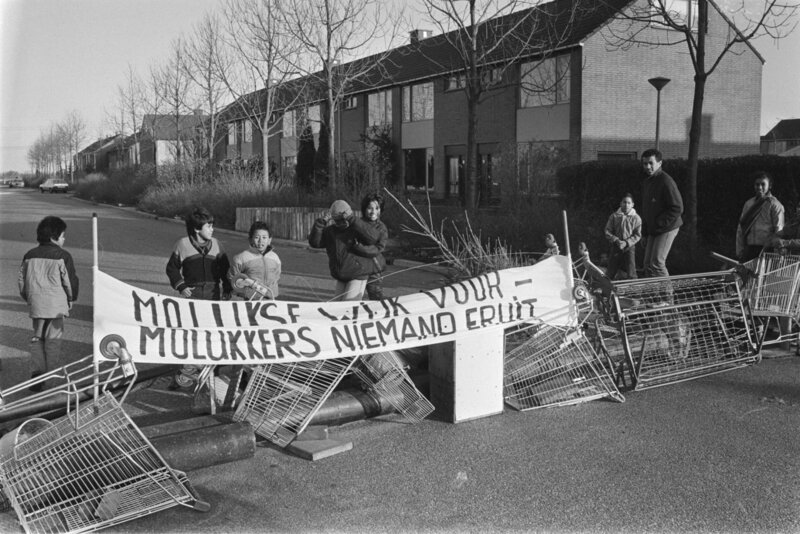 Both groups faced each other since the 'Moluccan district "would be evacuated several homes in Oostgaarde. The Moluccan residents of these houses refuse to pay rent. This part of the Oostgaarde district has been put down since the arrival of the first Moluccan at the end of the 50s. The houses are built fast and simple, according to residents, they are of poor quality. The houses and trips rather gaps are filled with old newspapers. therefore the energy bill is sky high. The Moluccan believe that they are in "inhumane conditions’ should live. Many Moluccans came to the Netherlands in the 50s after the independence of Indonesia. It often went to the army soldiers in the Dutch East Indies and their families. Often they had no choice and had to order in Netherlands. But many of them were not planning to stay. They demand include financial support from the Dutch government, in the period they are here. The unemployment of the Moluccans is large (also because many of them were not working in the early years). Free- or to rent is seen as a privilege. But that did conflict with housing SVW. The housing sits with 1.100 tenants in the district who pay little or no rent. If talks yield nothing stop paying altogether Moluccan. Earlier this year the gap had increased to 600.000 gulden. Every month there again 60.000 gulden bij. When the house foundation meanwhile come into threats. A Molotov cocktail is thrown in at a fulcrum. Still, SVW decided to proceed with eviction, supported by a court ruling. A failed attempt yesterday afternoon. Therefore there are more broken up by the police. When the first buses of the mobile unit Oostgaarde within reason, they have been met by a large group (especially young) Moluccan. The approximately one hundred men of the mobile unit then stood at the Bandra Neira. The officers who formed a united front with shields, went step by step forward, with gun drawn. Fierce hand-to-hand combat broke out. Agents were pelted with stones and petrol bombs. The front line drew their service weapons. One of the officers was pulled lower during the riots and lost consciousness. Another agent who crashed, fired a shot. In the rear a boy was hit in the leg. He was transferred to arterial bleeding to the hospital. Then managed to grab the Moluccan ward council. The violence led them too far. Said one of the members of the council "that the police and the bailiff to do their job '. Much work is not, for the houses to be evacuated, were already empty. That was the night before happened, After the failed evacuation, yesterday afternoon. A few hours later were all involved together again for the umpteenth attempt at conciliation. Mayor Van Leeuwen refuses to cooperate with a repayment plan for the eight families through the Municipal Credit Rotterdam. "In that case Capelle must guarantee and therefore we lack the money", says the mayor in Het Vrije Volk. "The evacuation will unfortunately whatever it takes to go through." 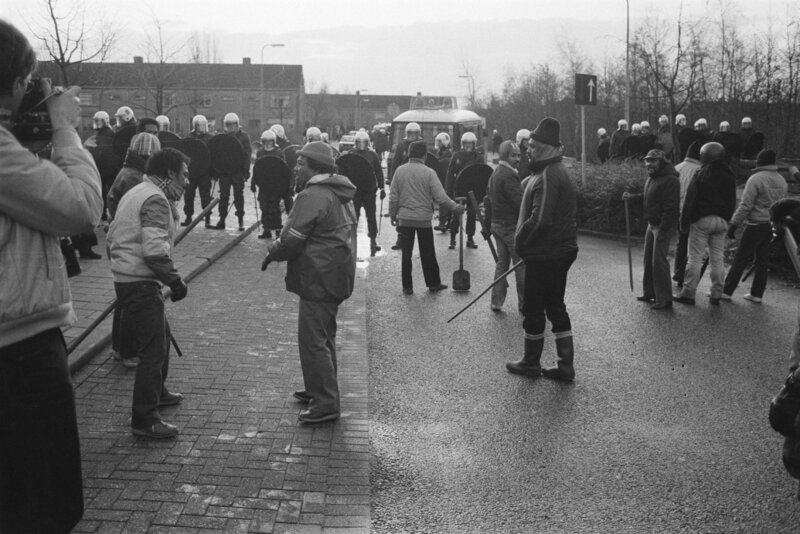 On this day (4 januari 1984) still in Kesteren (Gelderland) prevent a similar situation. Here too there is a large rent arrears and there are however agreed on a payment. The ultimatum SVW had was impossible to satisfy the Moluccan imposed. The families had a rent debt 13.000 gulden. They were the first 6.500 guilder immediately cough up the rest within a year. It's impossible for a family that comes around the minimum wage. 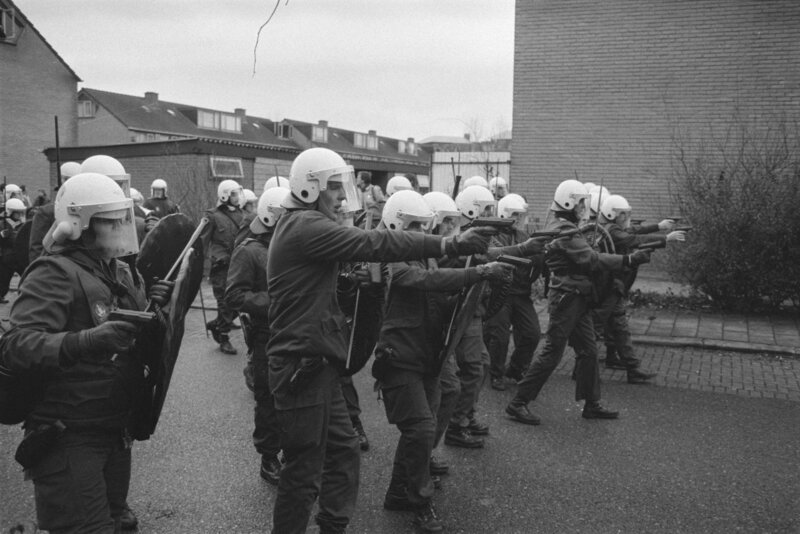 In the days after the riots agents Oostgaarde shot during surveillance. Then the municipality Capelle decision, already shocked by all the negative attention, in order not to proceed with the evictions. The ward council calls its turn to lay down their arms. Also is appealed by the ward council to surrender weapons, but satisfies no one. Later, four men arrested for the shooting of officers. There are eight people arrested for arson in housing SVW. For the riots in the district Oostgaarde total 33 people arrested. Much does a confession. “The free people : democratic-socialist newspaper“. Rotterdam, 04-01-1984, p. 1. “The free people : democratic-socialist newspaper“. Rotterdam, 05-01-1984, p. 4. “The Telegraph“. Amsterdam, 05-01-1984, p. 7.